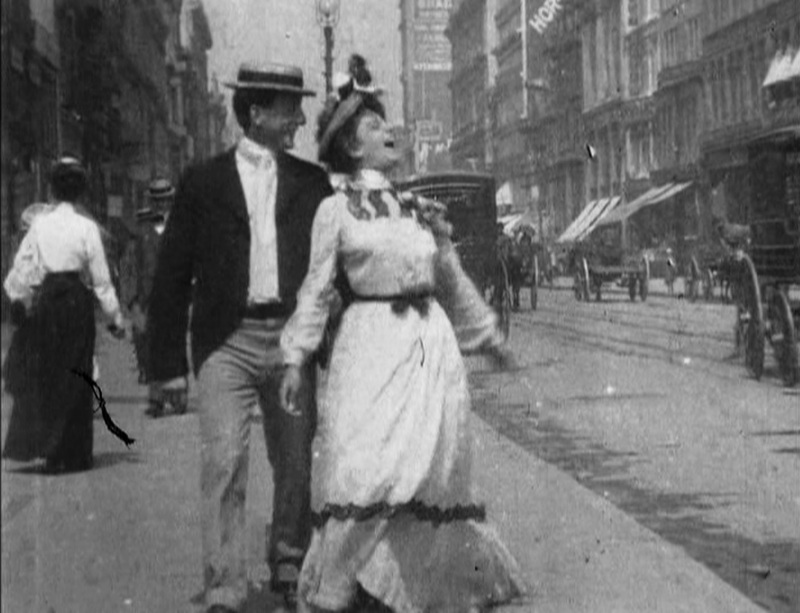 This short comedy is a wonderful location shoot of my home town, allowing a window into the past by showing a city street on an average day at the turn of the century. It also repeats some of the tropes of gender and voyeurism that we’ve grown accustomed to in Edison movies. We see a busy city street, looking directly down the street from the edge of the sidewalk. Crowds of people pass by in all directions. There are electric streetcars and many horse-drawn vehicles in the street, but no motorized vehicles are in evidence. A boy in a cap stands to the left of the frame, staring directly at the camera, and one man, who crosses in front of it suddenly steps back as if he were told to get out of the shot, but for the most part people act naturally, as if the camera were not there. A number of people jaywalk by crossing the street in the middle, not far from the camera’s position. A couple, quite distant at the beginning of the film, approach it slowly through the running time. Finally, when they are just close enough to be centered in the shot, they step over a grate in the sidewalk and the woman’s dress is blown up around her ankles, rising almost to her knees before she grabs it and demurely holds it down and steps off the grate. She looks embarrassed at first, but suddenly bursts into hearty laughter at the end. Before I get into analyzing this film, I want to talk about an odd piece of Americana. 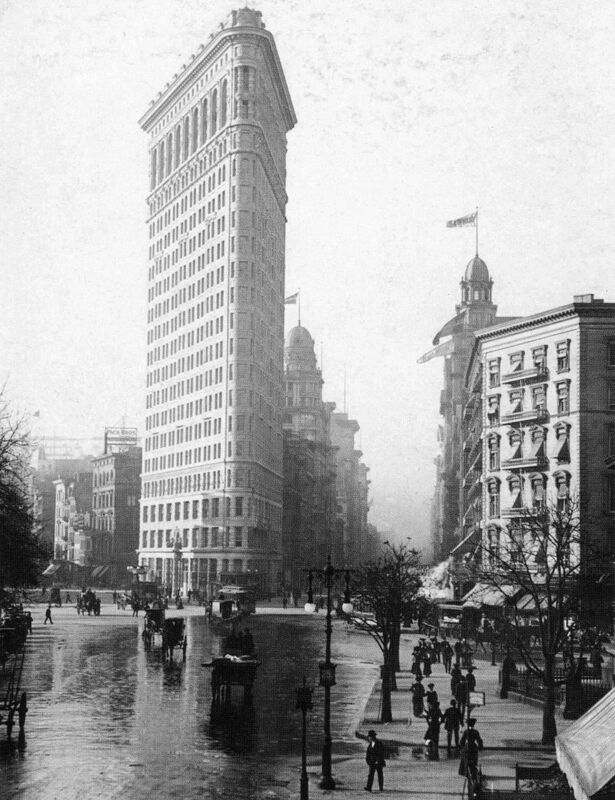 A fascinating architectural structure, known as the Flatiron Building, is located at Twenty Third Street and Fifth Avenue in New York. This building, because of its odd shape, famously channels a great deal of wind onto the nearby sidewalks. Supposedly, a certain class of New York male began to congregate there to observe women’s dresses blown up by the wind, because it offered a rare sight of female legs. The story goes that the phrase “23 Skidoo” comes from these men being regularly rousted by policemen on patrol. This may all be more or less legend, but this movie adds some credence to the idea that Twenty Third Street was associated with opportunities for voyeurism and exhibitionism, and offers its audience a safe opportunity to engage in it. What really stands out to us today is the wonderful location shooting, and the chance to see fashions, architecture, and vehicles of a previous century in excellent detail and under more or less documentary conditions. Nearly all of the men are wearing straw hats and neckties, and most of the women do wear long, heavy dresses that conceal their bodies from view. One interesting question it raises is whether the “star” of this movie was played by a woman or a man in drag, as was the case with many Edison pictures. Imdb credits a female actor, but the Library of Congress does not specify. Either way, she definitely breaks character at the end when she bursts into laughter, I think because of some comment a passerby has made. Of course, she would have been in on the joke from the beginning, so her apparent embarrassment is an act, whatever her gender identity may have been.